Mennonites first moved into Glenwood Springs, a mountain resort town on the West Slope of the Rocky Mountains, during the spring of 1955. The Mennonite Board of Missions and Charities had been requested to operate the local Valley View Hospital and invited Mennonites to settle in the area. The 35-bed facility was dedicated on 14 August 1955 and opened for business two weeks later. The date of the hospital's dedication was also the date of Glenwood Springs' first formal Mennonite Sunday morning worship service. It met in the basement of the John and Grace Hershberger residence with 65 persons in attendance. The group, which met in the Hershberger basement for the next two years, formally organized as the Glenwood Mennonite Church on 18 March 1956, with 18 charter members. In August 1955 Samuel Janzen, who had previously served five years as Mennonite administrator of the Kiowa County Memorial Hospital at Greensburg, Kansas, became the congregation's first pastor as well as the hospital's first administrator. Some 70 Mennonites served at the hospital as Voluntary Service workers between 1955 and 1965. By August 1956 the congregation had purchased property; it began construction of a church building on 10 April 1957 under the direction of a newly-organized Voluntary Service Building Unit. The congregation moved into the basement of the new structure in October and dedicated the completed structure on 27 July 1958. By the summer of 1958 the congregation had grown to a membership of 30, and the Sunday School enrollment had reached the 70s. Among other outreach activities, the church sponsored the "Mennonite Hour" radio broadcast on a local radio station and began a community women's Bible class. Church membership and Sunday school enrollment continued to increase; the former peaking at 72 and the latter reaching a high of 102 in 1962. Glenwood Mennonite was a charter member of the Rocky Mountain Mennonite Conference in 1961 and the Mountain States Mennonite Conference in 2006. Janzen served as Glenwood Mennonite's pastor until September 1961 and as Valley View Hospital administrator until 1967. In 1977 Mennonite administration of Valley View Hospital ended. Thereafter, Glenwood Mennonite Church's membership gradually declined. Throughout its history Glenwood Mennonite Church has been active in community ministry and service projects. In 1981, for instance, the congregation established the Little People's Place Day Care Center. Lauren Martin, who served as the congregation's pastor in 2010, began his pastorate in May 1992. His community involvements have included service as chaplain and membership on the ethics board of Valley View Hospital. The 50th anniversary of Valley View Hospital and Glenwood Mennonite Church was marked by a succession of historic and celebratory events. The opening ceremonies for a new hospital facility coincided closely with the return of Janzen and some of Valley View's other original Mennonite staff members for a reunion and sessions of the newly-organized Mountain States Mennonite Conference in September 2005. In 2007 Glenwood Mennonite's average attendance was 35-40. In 2016 Glenwood Mennonite Church changed its name to Defiance Church, after the original name of the town. On its website, it further said, "Defiance is a witness to the story that God, in Jesus Christ, defied death on a cross through resurrection. In a world bent on death, defiance is to be our stance as a people of life." Glenwood Mennonite Church, 2306 Blake Avenue, Glenwood Springs, Colorado, 1955-2005. 2005. Unrau, Harlan D. In Pursuit of Land, Health and Mission: A History of Mennonites in the Mountain States Region. Printed in Canada by Blitzprint Inc. 2007. 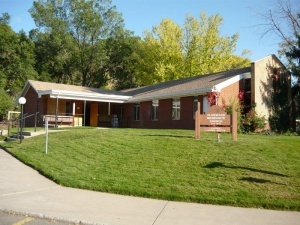 Glenwood Springs Mennonite Church (Mennonite Church) is located in south Glenwood Springs,Colorado. The congregation was organized in March 1956 and the church built in 1957. The membership numbered 35 in 1959. Samuel Janzen was the pastor. Unrau, Harlan and Sam Steiner. "Defiance Church (Glenwood Springs, Colorado, USA)." Global Anabaptist Mennonite Encyclopedia Online. June 2017. Web. 22 Apr 2019. http://gameo.org/index.php?title=Defiance_Church_(Glenwood_Springs,_Colorado,_USA)&oldid=148702. Unrau, Harlan and Sam Steiner. (June 2017). Defiance Church (Glenwood Springs, Colorado, USA). Global Anabaptist Mennonite Encyclopedia Online. Retrieved 22 April 2019, from http://gameo.org/index.php?title=Defiance_Church_(Glenwood_Springs,_Colorado,_USA)&oldid=148702. This page was last modified on 3 June 2017, at 10:57.